Goal: As part of its modernization efforts, the Homeland Security Department's Citizen and Immigration Services agency wanted a way of reducing paperwork and manual tasks by accepting popular applications, such as green-card renewals, online. Obstacle: To comply with the Government Paperwork Elimination Act, the solution had to be finished in a matter of weeks. It had to be open enough to work with existing systems, including the agency's legacy claims processing systems and the Treasury Department's payment processing program. Solution: Prime contractor Computer Sciences Corp. brought in EzGov Inc., developers of a Java-based software platform for rapidly deploying e-government applications. The team created an Internet-based e-filing solution to handle online forms and an internal application for case management. Payoff: In little more than a year, the e-filing solution handled more than 150,000 online applications. The information automatically feeds into the agency's claims processing system without manual data entry. The agency recently added more forms to the e-filing tool, accounting for more than half of the applications it receives each year. CSC's Ken Harvey said the company offered Homeland Security a choice of a custom-developed system or a solution based on off-the-shelf software. You don't have to be an immigrant in the United States to know that renewing a green card can be a long, drawn-out process. Obtaining "lawful permanent residence," as the government calls it, has been the subject of Hollywood movies and spawned a cottage industry of companies that can help immigrants navigate the system. Citizen and Immigration Services, part of the Homeland Security Department, is doing what it can to ease the pain. The agency is rolling out a marketing effort in select cities touting an electronic filing program that can reduce the time it takes to renew a green card from a year to several days. This newfound confidence in providing better service to the citizen is the result of a project that started in 2002, before the Immigration and Naturalization Service changed its name and became part of DHS. That year, the agency approached Computer Sciences Corp. to develop a portal that would let people submit forms online. To the principal developers, the program is the type of e-government solution that agencies can deploy quickly and cost effectively to streamline operations and improve customer service. 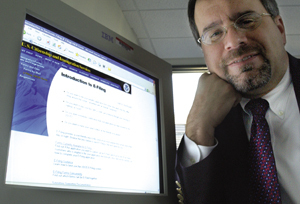 In May 2002, CSC presented the immigration service with two choices for its e-filing program: a custom-developed system or a solution based on off-the-shelf software from Atlanta-based EzGov Inc. According to Ken Harvey, CSC's benefits systems program manager, a custom solution would have taken longer to implement and would have cost up to 15 percent more than the EzGov solution. The agency wanted the solution finished in just 11 weeks to comply with the Government Paperwork Elimination Act, so the team chose EzGov and its FlexFoundation platform. FlexFoundation consists of three programs: the Business Transaction Manager, Payment Manager and Developer Studio. "The primary advantage of using off-the-shelf products was that we didn't have to design and write the basic engines that run on the Web servers -- They're ready out of the box," Harvey said. "We saved all that time and engineering, and we could go about the business of developing online forms and writing rules for workflow and payment." In July 2002, CSC and EzGov put together a 22-person development team to help meet the tight deadlines. The application was finished ahead of time, but wasn't launched until 2003 while the immigration service ironed out regulations for deploying the system. In the first phase, the project called for a system to handle three standard forms, including forms for green-card renewal and employment authorization. Getting the software running was fairly straightforward, but the agency also wanted users to be able to pay their application fees when they filled out the online forms. However, they didn't want to set up their own payment processing system. Because EzGov's Payment Manager software operates as a Java-based Web service, CSC and EzGov were able to connect the application with the Treasury Department's Pay.gov system. "We built a plug-in to Treasury to allow those payments to be processed," said Jeff Cummings, vice president of EzGov's federal division. The e-filing program now runs on the immigration service's Web infrastructure. The agency uses Intel servers running Windows Server 2000, with Microsoft Internet Information Services on the Web servers and Caucho Resin, a little-known application server, operating on the back end. Cummings said the fact that the EzGov solution runs smoothly on a niche application server such as Caucho Resin is a testament to the software's portability. The entire solution integrates seamlessly with the agency's claims processing system. Before, employees had to manually enter information from the three online forms. Now the data is captured electronically and fed into the legacy system. While CSC and EzGov were building the e-filing solution, they also created an internal application that runs on the immigration service's intranet for tracking and managing online applications. "Both the external and internal applications are thin-client programs, so nothing has to be installed on any desktop system," said Andy Russell, systems engineer at EzGov. This thin-client model is becoming more important in government modernization projects because it makes deployment easier, said Harvey. Through the first phase of the e-filing project, the agency accepted more than 150,000 online forms. The second phase, which began in May and included six additional forms, will add significantly to the solution's workload, Russell said. The nine online forms available today account for more than half the applications the agency processes each year. CSC and EzGov plan to expand the system's ability to accept applications electronically. According to Cummings, the EzGov platform is basically a data collection tool and easily could be designed to accept information via phone or wireless device. "We've embraced the concept in modernization and case management projects of 'common intake,'" Cummings said. "However you dump the data into the funnel, let's make sure it's processed through the same set of business rules." If you have an innovative solution that you recently installed in a government agency, contact Staff Writer Brad Grimes at bgrimes@postnewsweektech.com.